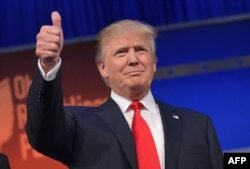 Trump once again will be the center of attention as he was in the first debate last month in Cleveland; but Trump is expecting plenty of barbs headed his way from Republican rivals intent on seeking to share the spotlight in what has become an unpredictable and heated contest for the party's presidential nomination. Trump has expanded his lead in public opinion polls since the first debate last month. 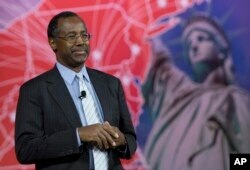 A new poll shows him with 40 percent support in New Hampshire with fellow newcomer Ben Carson a distant second. Trump also has shown no hesitation in striking back at those who dare to attack him, including South Carolina Senator Lindsey Graham and former Florida Governor Jeb Bush. Real estate tycoon Donald Trump flashes the thumbs-up as he arrives on stage for the start of the prime time Republican presidential debate on Aug. 6, 2015 at the Quicken Loans Arena in Cleveland, Ohio. Republican National Committee Chairman Reince Priebus told CNN’s “State of the Union” to expect “more elbows” to be thrown in the second debate, especially from Republican contenders who have sunk in the polls compared to Trump and Carson. Former Hewlett-Packard Co Chief Executive and Republican U.S. presidential candidate Carly Fiorina speaks during the Freedom Summit in Greenville, South Carolina, May 9, 2015. Bush has stepped up his criticism of Trump, while Senator Rand Paul of Kentucky told The Associated Press that someone has to “bring him down.” Paul added that he was not going to “sit quietly by” and let “the disaster that is Donald Trump become the nominee." Among those rivals taking a pass on going after Trump was Ohio Governor John Kasich, who is building momentum in New Hampshire in recent polls. Kasich told “Fox News Sunday” he would take the time to introduce himself to voters who don’t know much about him. The surge in support for Trump, Carson and, to a lesser extent Fiorina, suggests there is a strong desire at the moment for political outsiders among Republican primary voters. Among those hoping to grab a share of the limelight in the second debate is Texas Senator Ted Cruz, who has been very complimentary and deferential to Trump in the race so far. Cruz invited Trump to attend last week’s rally at the Capitol opposing the Iran nuclear deal. “This Iranian nuclear deal is catastrophic. It is the single greatest security threat facing America,” Cruz told those at the rally before giving way to Trump. 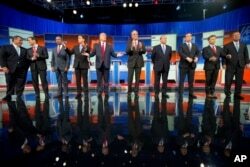 Republican presidential candidates, from left, Chris Christie, Marco Rubio, Ben Carson, Scott Walker, Donald Trump, Jeb Bush, Mike Huckabee, Ted Cruz, Rand Paul and John Kasich take the stage for their debate at Quicken Loans Arena in Cleveland, Aug. 6, 2015. “We are at the point now where voters simply want to express frustration and disappointment and anger with the direction of the country, and Republican voters [expressing] frustration with the president. And so they are looking for someone who gives them voice and Donald Trump certainly does that,” said Rothenberg. The Democratic contenders, including embattled frontrunner Hillary Clinton, won’t hold their first debate until October 13, by which time we may know whether Vice President Joe Biden will enter the race.